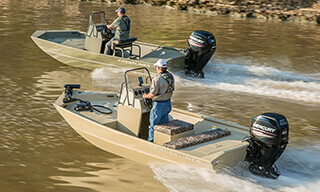 Set your goals and sights higher with the Retriever Forward Center Console (FCC), one of the best forward center console tunnel hull boats under 25’ for traversing shallow waters. When you’re on the hunt, the forward center console of the Retriever FCC offers better visibility of the shoreline and what lies ahead while keeping a small draft. 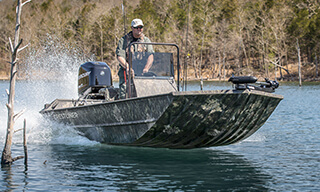 The FCC is an all-welded hunting and fishing powerhouse with a purposeful design and the unrivaled durability of a Crestliner boat. 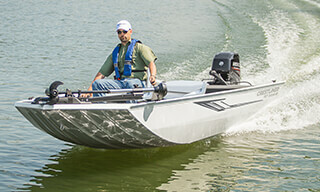 From the aluminum center console to the hull’s wood-free construction, and all the way back to the jet-powered engine, you can confidently go where other boats can’t go. 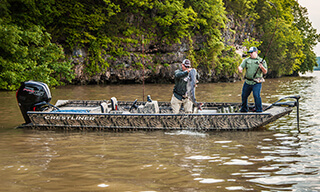 You’ll also find an aerated bow livewell, plenty of storage, and ample room to fish about the boat. The aluminum forward center console provides added visibility to what lies ahead and features toggle switches and space for electronics. Bow features spacious dual compartments storage to keep gear secure, stowed away and dry. 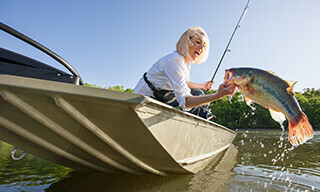 A livewell is also located in the bow for easy access.